Maddy has already been online having a terrific time building. I had to set a curfew for her last night, otherwise she would stay up till 2 or 3 am just playing with the program. I dragged her away from the computer today, but only for short periods of time, and mostly for nourishment. I can tell you she will probably be your best ambassador-not only to the teachers but to her peers, who as you know have more than a little influence on parents and such. This made my day, of course! Last year I blogged about Peter Kluzak, a wonderful 13-year old kid, who spent a lot of time at our ASA booth. Both we and he were back this year, since now-14 year old Peter was helping his mom in her Everyday Autism Jewelry booth (I love her puzzle-piece charms). We were only a few booths apart, so Peter again spent lots of time showing us what he'd done over the past year. His modeling skills are quite sophisticated now (plus he seems to be about a head taller - he towered over me, which isn't hard to do). Peter's model has scenes, so don't import it into another SketchUp model; it should be opened in its own SketchUp window. The 3D models of plants and birds came from the 3D Warehouse. The bird hanging from the "ceiling" is a "Shonisaurus popularis" modeled by Birdman, who's modeled dozens of prehistoric animals (among other things). Something to keep in mind for your own dinosaur-era projects! Think of all the shoeboxes we could save if all school projects were done in SketchUp! Good work, Peter - naturally he and his team got an "A." This was an honors science 8th grade project. It was great because he was able to easily transport it, the group did not have to arrange work sessions outside of school, and they did not fight over who HAD to take it home. With the Smartboards in the classroom, he was able to present it so everyone could see it. What a great tool for kids who are home schooled or eschooled. The two projects focus on communication, collaboration, and anxiety management. Please visit the new page, download the projects, and let me know what you think. More projects are planned for the future, and your feedback is very valuable. Here's what's in store for our July projects, which will be sent out on the 15th. If you're not yet a subcriber, it's only $36 for 36 projects (3 per month for 12 months), and you can sign up here. After July 15, you can also purchase just these 3 projects (no subscription) for just $5. 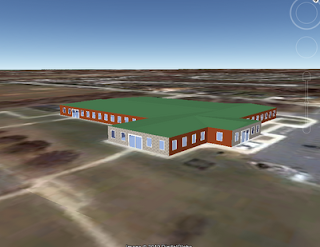 If you've wondered how those buildings on Google Earth's "3D Buildings" layer got there, this project will show you how. 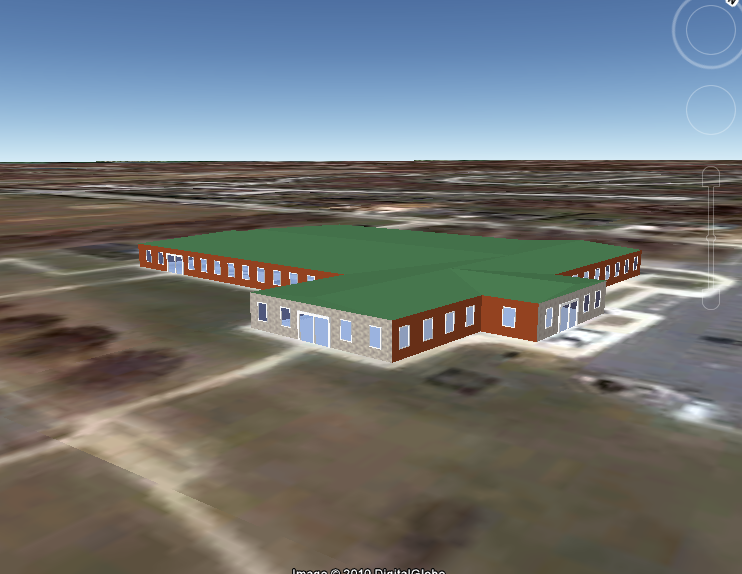 You'll use a Google Earth footprint as the basis for your SketchUp model, and see how to get your own models accepted into Google Earth. 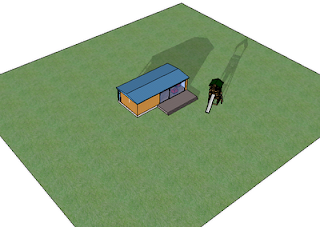 SketchUp's shadows are extremely accurate, based on the physical location of your model. Using scenes, you can produce an animation that shows how shadows will move across your model through the course of a day. You can also test your shadows inside rooms as well. 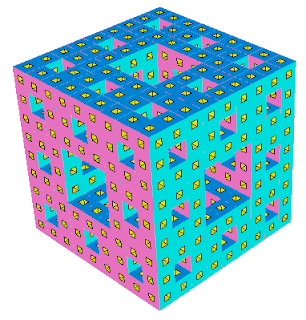 No, it's not for cleaning your kitchen, this "sponge" is actually a 3D fractal made of cubes. You start with just one simple cube, and make use of nested components to make as many copies as your computer can handle. There's no better way to beat the summer heat than to stay in the air conditioning and learn some new SketchUp tricks! Again, here's where you can sign up. This week ASA is holding their annual conference (Dallas this time), and I'll be hanging with Google in their booth again. We'll be promoting Project Spectrum, hoping to raise awareness of SketchUp as a tool for expression, career development, even communication. So far I've developed three projects for the Spectrum website (they're not up yet), which teachers, parents, and therapists of autistic individuals can use. How to use Google Earth and SketchUp to create a school project that uses scenes and fly-throughs rather than oral or written words. More projects are planned, and ASA is a great place to get feedback and ideas. I would also love to hear from anyone who has suggestions, experiences, etc in this area, so don't be shy. So far I've mostly used my own experiences with my 8-year old autistic son, who uses SketchUp like a whiz! A lot of high school teachers ask about using SketchUp to model cars. I guess that's what teenagers want to do once they've mastered modeling of houses, furniture, etc. Because cars are modeled along non-flat surfaces, and non-straight lines, it's not always an easy undertaking, but the Sandbox tools are very useful for modeling organic shapes. Anyway, I ran across this neat video of some concept cars made in SketchUp. Some are rendered in a third-party application (I think V-ray), and some of the views show partial models, enabling you to get an idea of how the surfaces were made. Very cool. I'm not wild about the accompanying music, but otherwise this makes me want to try out some Sandbox modeling myself. But in a little while I'm taking the kids to see July 4 fireworks instead! Last week, I got an email from rising 7th grader Gabe Coleman, whose mother has bought some of my ModelMetricks books. Apparently Gabe has read them well, and he's put his SketchUp skills to good use! Below is his prize-winning model of an eco-friendly park (clicking the model takes to its 3D Warehouse page, where you can download it). It's a pretty neat model: lots of solar panels, some windmills, recycling bins (clearly labeled with 3D text), and the requisite popcorn and sno-cone stands. Plus it's colorful and fun, and I'd want to hang out there with my kids. Download it and take a spin around! A couple months ago I entered in a Regional Tech Fair. I made an Eco-Park in SketchUp and presented it to the judges. I came in first place in my division and went on to the state competition. I added more to my park and once again presented it to judges. I was awarded second place. Here is a link to the Tech Fair site: http://www.alcte.org. I love your SketchUp books! I currently am on the the second level of books. The Beginner Series helped me learn the skills to build the Eco-Park. I am currently on the Intermediate Series and have learned lots more. In my 6th grade computer class, the teacher gave us an opportunity to compete against each other to see who could build the best SketchUp model. All the computers in the classroom have SketchUp on them. We would get a prize if we won. A friend and I made an Army Base and we won the contest! I always turn to the same thought: I wish I had software like this when I was in school. Excellent work, Gabe, please keep me posted on other cool stuff you create! The controls on the right side enable you to get a first person (your own) view, or a view looking at yourself from behind. You can also take snapshots of your walk-through. I've gotten pretty used to using SketchUp scenes to create walk-through tours, but 3DVia scenes are a lot easier to use (or at least they will be when I get the hang of it). This is just fantastic for so many markets: architects and interior designers can show clients their ideas, students can show teachers and classmates what they've come up with. Plus it's really fun. The dentist office model in the scene above is one I created for Project Spectrum, and you can find it in the 3D Warehouse (click below). To save it as a 3DVia model, the SketchUp model must be saved as a KMZ file using File / Export. In 3DVia, first upload the model, then create a scene. Once the scene is in your player, you can add 3D models to it, either models you've uploaded yourself, or models other 3DVia users have uploaded. I'm going to write this up in more detail as a project sometime soon, but give it a try in the meantime.